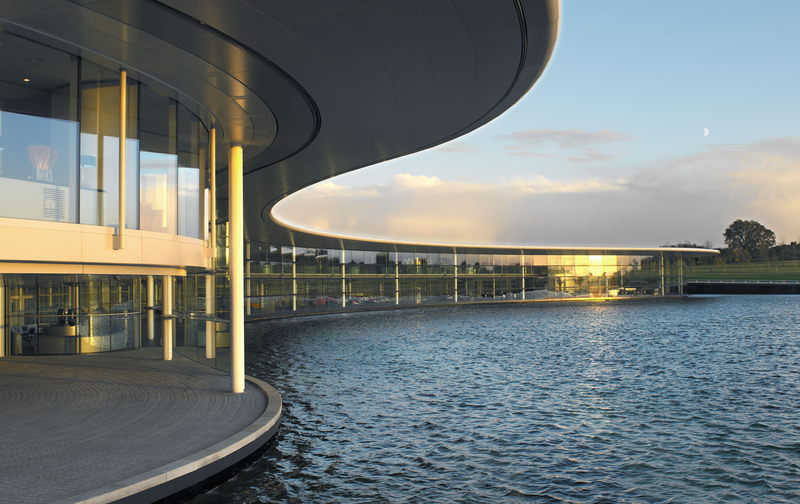 When you’re offered the chance to take a peek behind the scenes of a Formula 1 race team, you leap at it and fortunately for us as a McLaren employee my friend’s husband is able to offer a guided tour for up to four people a year at their high-tech facility in the heart of the Surrey countryside. If you have an interest in F1, automotive, engineering or you just happen to have a teenage son, it’s a chance not to be missed (I tick two boxes – automotive and the teen son, although I find precision engineering fascinating even though it’s completely over my head). 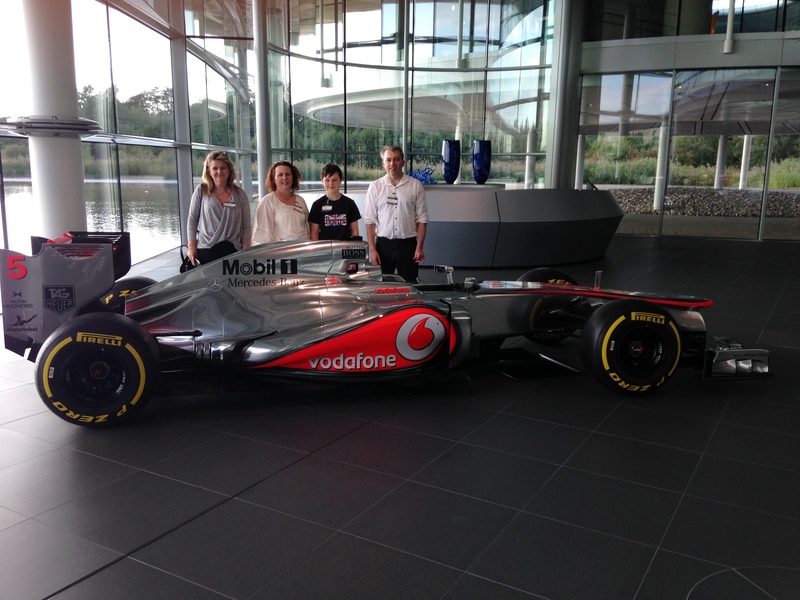 So one Saturday afternoon I joined my friend, my partner and my son for a personal tour of the McLaren Technology Centre or MTC from said husband who works as an engineer. It looks more beautiful rather than high-tech on arrival with full glass frontage and a manmade lake, but this building has been designed to blend in with the rolling countryside as well as incorporating a host of sustainable technologies such as energy efficient lighting, heat generated from electricity is captured and used and the roof is not only self-cleaning, but a clever drainage system collects rainwater to refill the lake which assists the building’s cooling system by regulating the temperature and decreasing the need for cooling towers. The MTC was developed on 50 hectares of barren land in Woking, which had been exhausted from decades of intensive farming. 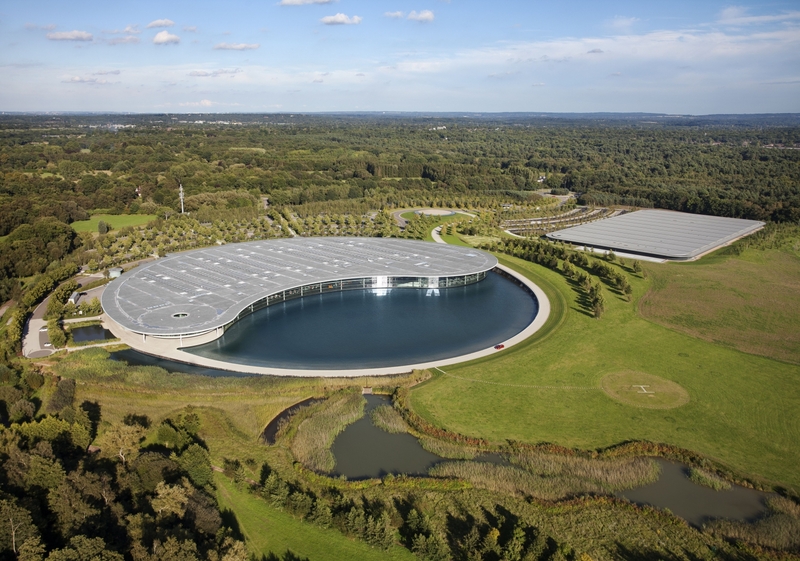 McLaren’s vision to ‘breathe life’ into the land has definitely been realised. In 2010 the building was awarded the Carbon Trust Standard certification and to maintain the standard, the facility is re-evaluated every two years and has so far been re-awarded the coveted credential twice. Alongside, McLaren Racing was announced as the first ever carbon neutral team in F1 in 2011, recognised by the FIA which awarded the team the first FIA Institute’s Environmental Award. McLaren even turned its attentions to the outside creating a wildlife haven which is now home to exotic orchids, skylarks, waterfowls, six species of dragonfly, grass snakes and even kingfishers. An otter family moved in within two weeks of the habitat being finished. Recycling is big here and the centre is on its way to achieving sending zero waste to landfill by the end of this year. As if the building itself wasn’t interesting enough, inside is equally fascinating. It is shrouded in secrecy; after all, McLaren doesn’t want its employees inadvertently leaking its developments to the competition so photos were restricted to one vehicle, driven by Jenson Button, who will once again be seen behind the wheel of a McLaren when he races for the McLaren-Honda team in 2016. The car sits on the opposite side of the vast high ceilinged atrium to the line-up of previous racing cars which the McLaren team has fielded. Driven by an array of F1 glitterati such as Ayrton Senna, Mika Häkkinen, Emerson Fittipaldi, Niki Lauda and, of course, our very own James Hunt and Lewis Hamilton, touchingly, the line-up is headed up by the Austin 7 Ulster, the first car Bruce McLaren raced in his native New Zealand at the tender age of 14 in 1952. The MTC, though, is so much more than a hall of fame of some of the most famous names in motor racing. Its chairman and CEO Ron Dennis, for example, describes the business as a ‘technology company’. And this is easily the most enthralling part of being behind the scenes and talking to some of the employees. We spoke to engineers whose job it is to interpret the intricate designs provided to them by McLaren’s designers, programme sophisticated computers which operate the incredible pieces of machinery producing the staggering 76,000 parts* needed to make a McLaren racing car and often finishing by hand for precision fitting. In fact, the guys who work here make a part every 17 minutes*. My son was particularly fascinated by a borehole measuring tool, one small rod was 0.02ml bigger than another. If the smaller rod fitted the hole but the ever so slightly, can’t be seen with the naked eye (at least mine) didn’t, it was a perfect fit. Even when my son put both the rods end to end, I couldn’t see that one was larger than the other. I won’t even attempt to go into detail about the various stages a McLaren component goes through before it is finally fitted to the F1 vehicle, I don’t understand it and I can’t do it justice, although there is a lot of carbon and the people we spoke to love this material, but it is, fascinating (yes, I know I have used that word a few times, but really there is no other to describe our visit). Even on entering the facility, you know this is a seriously high tech place (obvious even to a technophobe like me). You descend silver spiral steps and walk along a long white tiled passageway, this place looked cleaner and more pristine than any hospital even in its underground ‘belly’ where much of the engineering takes place. However, what struck us more than anything is that this is a seriously nice place to work. Everything is contemporary, the staff canteen overlooks the lake where huge fish bob near to the surface, vast ceilings and the glass frontage bathes the above ground levels in natural light. Even the furniture is funky, we loved the chairs made of purple rope. Allowing employees to take friends and family on a tour of the facility is brilliant; I can’t believe anyone would feel anything other than very much a part of one of the UK’s most advanced technological facilities. By restricting the numbers to four a year not only means the centre isn’t overrun by nosy and awestruck visitors like us, but also gives it a VIP touch which we relished. For me, it also gave my son an insight into the world of work and the vast amount of jobs in engineering (although currently the first choice of career is medicine). It’s fine, both need the sciences and maths and that would meet with Ron Dennis’ approval. 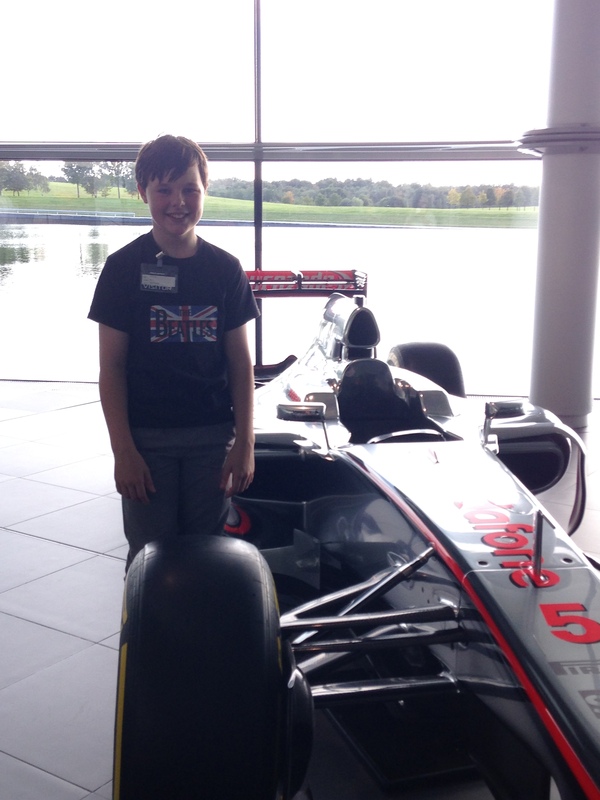 And inspired my son most certainly was so thank-you McLaren for allowing your staff to share your fabulous facility with their friends and family.